​Revive your complexion with our expertly formulated range of deep acting Skin Peels. A skin peel can rejuvenate your skin to reveal more youthful, softer and smoother looking skin without any of the side effects associated with invasive surgery. We picked the brains of Dr Asif Hussein, Medical Director at our London Victoria and Esher clinics, to get answers to some of the most common queries about TCA peels. Is a TCA peel a deep chemical peel? A TCA peel above 10% is a medical grade peel and should not be performed by non medically-qualified individuals. This is because it is a medium-depth to deep peel (depending on the strength of acid used) meaning it has the capability to pass beyond the epidermis (the outermost layer of skin) and even potentially to the top of the reticular dermis (part of the dermis; the next layer of skin after the epidermis). It is therefore a procedure that should be performed in a controlled environment, by trained medical professionals (a nurse or doctor). Are TCA peels worth doing? A TCA peel is a fantastic tool to get rid of sun-damaged skin and allow a completely new epidermal layer to grow. If done correctly, the results can be dramatic. 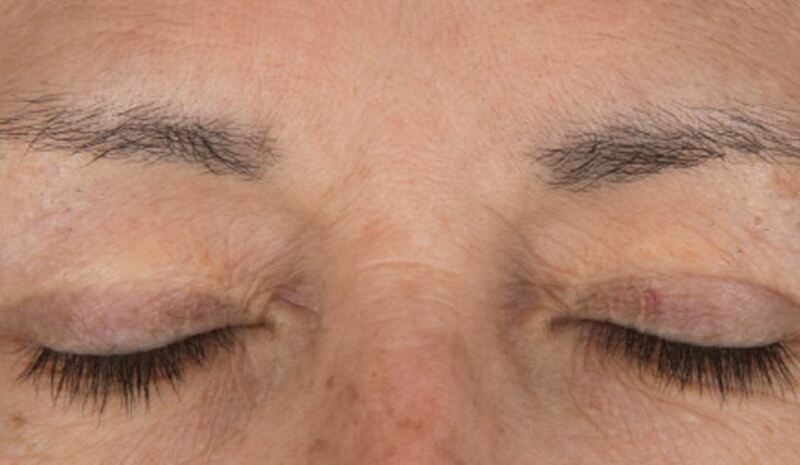 It comes second only to laser resurfacing as a method of getting complete renewal of skin layers. It will help improve shallow wrinkles and help to smooth the skin. There will be new collagen (the protein which gives skin its firmness) formed within the treated skin. 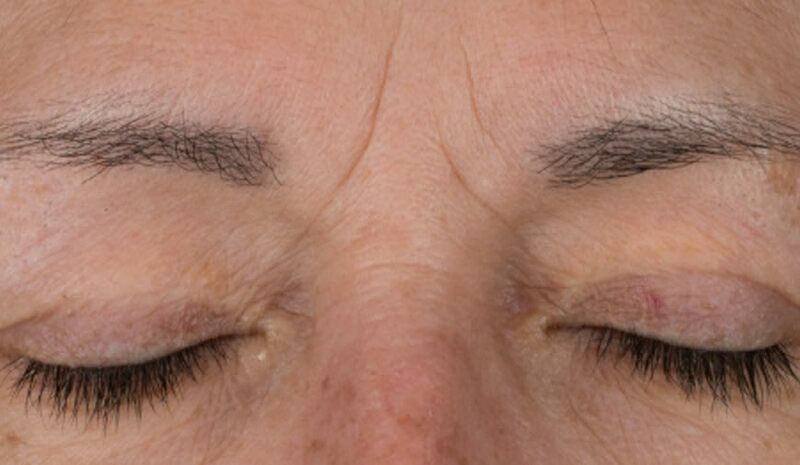 Superficial pigmentation can also be tackled with TCA. Even abnormal cells within the superficial layers that may go on to form serious problems in the future (actinic keratoses etc) can be effectively removed with the appropriate concentration of TCA. What is the recovery time for TCA peels? This varies depending on the depth of TCA peel performed. But, typically for a mild TCA (with a strength of 10-15%), the recovery time will be about four days. If a more aggressive peel is performed, or a combination TCA peel, recovery time may be about seven days. There may be some mild redness that persists for a further week, but this can be covered with foundation. Are chemical peels such as TCA only beneficial for people with problem skin? No, TCA peels are beneficial for all types of skin. However, caution must be used when applying TCA to darker skin types and the treatment should only be carried out by a doctor in this case. The act of peeling the skin on a regular basis encourages new cell turnover and in the long-term brings about a process known as ‘neocollagenesis’ and collagen remodelling. In short, this means your skin will be tighter, smoother, free of pigmentation and have a healthy glow. An appropriate at-home skincare regime can be used to maintain the results. Topical retinoids such as 0.3% or 0.5% retinol, or retinaldehyde, work well to continue the benefits of peeling. Your practitioner, nurse or doctor can help you to choose the most appropriate maintenance regime for your skin. Is a TCA peel a one-time solution? Environmental factors such as UV damage, dehydration and pollutants are a constant strain on your skin. Therefore, performing a procedure like this only once is like going to the gym only once. TCA peels are a slightly heavier procedure and should be performed (depending on strength) a couple of times a year for optimal benefits. If a mild TCA is used, perhaps 3-4 times a year. How many TCA peels are needed to see results? If a stronger TCA peel is performed (20% - 25%, or a combined TCA peel) results will be immediate after one session. Weaker strengths may require a course of 3-4, followed by maintenance every few months. TCA is a medical grade product and is safe if used by appropriately trained hands. As with any procedure, there are potential side effects, such as post-inflammatory hyperpigmentation, prolonged redness, cold sore virus infection, post-procedure contact irritant dermatitis, and even infection and scarring. But if used by trained medical professionals, these risks are minimal. Remember, this is a medical procedure, not a beauty salon procedure. How many TCA peels are needed to remove acne scars? TCA peels are beneficial for mild boxcar acne scarring, or mild rolling scars. Ice pick scars need a special type of medical procedure called TCA CROSS. 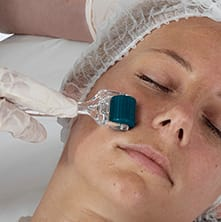 TCA peels will lead to a mild improvement in acne scar, but for substantial improvement of acne scars, more invasive procedures such as laser resurfacing are required. It is important to remember that acne scarring is tough to treat and virtually impossible to completely remove; it can only be improved. Managing acne effectively in its early stages can help prevent scarring. Dr Asif Hussein. MBBS DHMSA DipDerm FASLMS GDipLaw PgDip Legal Practice, is a specialist in Cosmetic Dermatology & Laser Surgery and is the Medical Director of sk:n London Victoria & sk:n Esher alongside holding the post of Honorary Lecturer at Queen Mary University of London. Excellent customer service. Really friendly. Made me feel really comfortable. Really good products aswell. Recommend to anyone suffering from acne. Knowledgeable and informative staff who really care about your end results. Thank you Sk:n! From the moment I walked through the door it was a lovely relaxed enivornment and the receptionist was lovely and welcoming, Sarah who saw me was brilliant and she helped me understand why my skin was like it was and gave me a variety of different products to replace my daily routine. I'm also having a treatment done by her every 2 weeks and I had my first one yesterday & I can already see the results! The prices are very reasonable for the treatments and products. I'm so happy I chose skin and I would highly recommend them to anyone. I've got a feeling it's going to be the best money/decision I've made. I'm feeling more confident & happy!! The nurse assessed my skin, and gave her honest opinion as to what treatment was recommended for my skin problem. The treatment I had was very good, I can see a brighter complexion after only one treatment. Great experience! Appointments are on time, and lovely staff. Feels very calm and relaxing at the Northampton branch. I've gained so much information about my skin and my skin routines etc is been so great and I've recommended you to everyone I know! Very friendly and welcoming staff. Didn't feel pressured to buy their products or treatments. Staff tries to find best solutions for individual needs. Only had one treatment so far, but see the difference already and feel postive. Highly recommend! The staff are lovely, understanding and empathetic. It feels professional and also friendly. I would highly recommend. Lovely staff, excellent treatment results! Sk:n Nottingham are both ultra professional and incredibly friendly. They make you feel instantly at ease, and comfortable with their knowledge that you're doing the right thing for your skin! I'm can't recommend highly enough! I had never had a skin 'treatment before, I'd only been to "spa" type places. Sk:n is quite different. It was certainly relaxed and friendly, but over and above that was a distinct sense of professionalism, care, and safety about the treatment I was undergoing. Even checking I am the patient named on the forms was carried out with me. As a registered nurse and midwife that was an early sign of accountability and responsibility about the work Sk:n do. Some of the treatments are with potentially harmful chemicals and the right treatment for the right patient Is very important as well as close patient checks during the treatment. This all happened. Very reassuring. Will I have more treatments in the future? Absolutely and will recommend Sk:n to other people with skin problems . The nurse was amazing and informative throughout the whole treatment (I had the Mandellic Peel) - She let me know step by step the stages of my peel and ensured I was comfortable the whole time. Can't wait for my next one! Love the staff and service here. Very welcoming, explain everything fully and feel at ease with the treatment. After my thorough consultation with friendly, understanding staff, I was recommended a 3 step treatment to suit my skins' needs. The staff make sure that you feel comfortable with treatment at all times, and offer detailed advice concerning aftercare and any reccommended products to compliment your regime. I'm glad I finally decided to have a consultation and am seeing positive results for my acne treatment already. The staff were really welcoming and friendly from the moment I walked into the clinic. I was given plenty of advice on my options and aftercare for the chemical peel I was having and all my questions answered fully. The girl who was carrying out my treatment was so positive and, even though I had some reservations about the treatment and was worried about side effects, she really put my mind at ease and helped me to relax with her sunny personality, friendly chit chat and reassurance. It's the day after my treatment and my skin looks clearer already and I'm happy with the results so far. I was given a discount on my next few peel treatments. I'd definitely recommend this clinic to anyone and will be coming back again. Lovely and informative staff, attentive to everything and very knowledgeable about skin care. Really good customer service all with great knowledge and all very friendly! Everything is very well run. During appointments and treatments all the staff are very lovely and answer any questions that you might have. WHAT'S IN A SKIN PEEL? At sk:n, we use an advanced range of skin peels called Enner Peel, which contains a patented carrier-solution that drives greater absorption of the active ingredients into the skin. This deep-acting technology reduces trauma to the skin’s surface and increases the rate of exfoliation for improved results. Each peel produces a varying level of chemical exfoliation to treat different conditions, classified as light, medium or deep. Your nurse or practitioner will discuss the best peels for your skin complaint and the results you can expect to see during your consultation. You will notice improvement in your overall complexion after your first Skin Peel. WHERE ON MY BODY CAN I HAVE A SKIN PEEL? Our range of Skin Peels can be used for the face and almost any other area of the body. We offer specific peels for the hands, neck and décolletage. Yes, our Skin Peels are completely safe and undergo stringent testing on all skin types and tones: first by the manufacturers; then by our Medical Standards Team; and finally during the training of our practitioners. During treatment your eyes and hair will be protected. You may experience a slight tingling sensation as the peel works during your treatment, but this is completely normal. Below is the criteria for the Fitzpatrick Skin Type scale, which we use at sk:n to determine which type of treatment is best for you. Skin Type 1 - Light, pale white tone. Always burns and never tans. Skin Type 2 - White, fair tone. Usually burns, tans with difficulty. Skin Type 3 - Medium, white to olive tone. Sometimes mild burn, gradually tans to olive. Skin Type 4 - Olive, moderate to brown tone. Rarely burns, tans with ease to a moderate brown. Skin Type 5 - Brown, dark brown tone. Very rarely burns, tans very easily. Skin Type 6 - Black, very dark brown to black tone. Never burns, tans very easily, deeply pigmented. A non-toxic chemical solution is applied to the skin surface and absorbed, before releasing the active acid component, which then works from within the skin. This treatment can be used without any problems on the delicate areas around the lips and eyes. Some peels can lead to light swelling of the affected area or peeling of the skin for a few days after the procedure. A trained expert can give you the advice you need on the right type of peel for you, devising a tailored treatment plan to achieve optimum results. IS A SKIN PEEL TREATMENT RIGHT FOR ME? 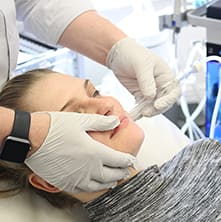 Skin peels can be used to treat a whole range of skin complaints, including wrinkles, fine lines, acne and acne scarring, age spots, enlarged pores, dark areas and sun-damaged skin. This treatment is ideal if you are looking to quite literally give your skin a fresh start. Book a consultation with one of our trained experts to discuss which skin peel is best for you. After the first treatment and starting on your skin preparation regime * you will notice improvements. Your skin will feel softer and look subtly younger. Further regular treatments will ensure you achieve your desired results. At sk:n we pride ourselves in having a supportive aftercare regime catered to the individual to ensure you get the desired results with regular support from us, please visit our aftercare page for more information on the aftercare process of all skin treatments. Microdermabrasion is an effective treatment which sloughs off dead skin cells, giving you a clearer complexion. 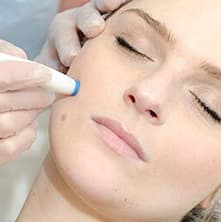 Offering long lasting results, Microneedling is a popular anti-ageing and acne scarring treatment. HydraFacial is a thorough detox for your skin. The treatment exfoliates, cleanses, plumps and hydrates to give you glowing skin.